The 246 GT sports car had impressed the market, and so Ferrari decided to capitalise on its success by introducing the convertible variant. Designated the 246 GTS Spyder, it was launched in 1972 at the Geneva Motor Show, and featured a detachable Targa roof panel similar to that used in the Porsche 911 Targa. It weighed 2426 lbs, compared with the 1980 lbs of the 206 GT, due in part to the fact that, unlike the latter which used aluminium, the body panels of the GTS were made of steel in order to reduce cost. 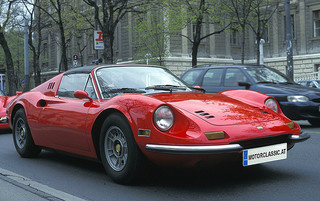 By the time production of the Spyder sports car ended in 1974, a total of 1,274 units had been built. 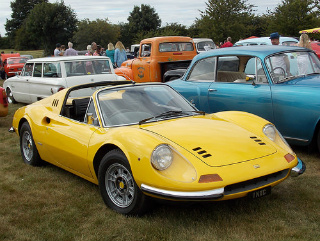 Ignoring the removable Targa top, the Spyder differed from the GT by the absence of the rear side windows, which were replaced by a panel containing three slits to aid air throughput. Near the end of production, a particular option was offered whereby the sports cars were altered in order to be fitted with extra wide 7.5 inch Campagnolo alloy wheels which were of a different design to the standard wheels. This entailed adding flared wheel arches, whilst alternative seats came from the 365 GTB/4 Daytona. These unique sports cars were described as the Chairs and Flares variant. LIke the 246 GT sports car, it was powered by a transverse mid-engined 2.4 litre, twin overhead cam, V6 unit which developed 195 bhp and 166 ft/lbs of torque. Fitted with a five speed manual gearbox, electronic ignition, and three twin choke Weber carburettors, this produced a top speed of 152 mph, and a 0-60 mph time of 7.5 secs. In terms of the second hand market, a Ferrari 246 GTS Spyder, in very good condition, was sold at auction in the US for $250,000, whilst one in showroom condition fetched $430,000 at auction. On the other hand, a superb example of a Chairs and Flares sports car reached $0.5 million at auction. 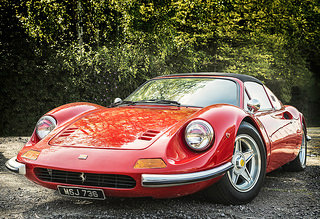 This was another of the classic cars from Ferrari.